Don’t drink – it’s harmful? Don’t get in the habit of drinking and eating in a marathon race; some prominent runners do, but it is not beneficial. I do not believe in eating during the race, as it can scarcely benefit one, as no nourishment can come from the food till digested, and the race will be finished before the food would be digested. … (In the marathon race) there is no need to take any solid food at all and every effort should be made to do without liquid, as the moment food or drink is taken, … some discomfort will almost invariably be felt. Four small bottles for a long stage [of the Tour], it is frowned upon to drink more…Avoid drinking when racing, especially in hot weather. Drink as little as possible, and with the liquid not too cold. It is only a question of will power. When you drink too much you will perspire, and you will lose your strength. And then finally, the winner of the “camel” award for endurance exercise without drinking is Jackie Meckler, who won the 89 km long Comrades Marathon five times. The race took him just under 6 hours, and his approach to fluid intake? As I’m sure any reader will appreciate, this attitude – drink infrequently, never if possible – is radically different from the current advice. For around the 1970’s and 1980’s, the winds of change were blowing through endurance exercise and fluid replacement. We shall look at the research that drove the paradigm shift in our next post of this series, but suffice it to say that the advent of the sports drink industry, and the money that accompanied it directed a new approach to fluid replacement of runners. The greatest threat to health and well-being during prolonged exercise, especially when performed in the heat, is dehydration…If this accumulation of heat is not dissipated, it will lead to hyperthermia and the potential to suffer a fatal heat stroke. Runners should be encouraged to replace their sweat losses or consume 150-300ml every 15 minutes (600-1200ml per hour). There are a few relevant points about this position stand. First, it’s a world apart from the historical practice, because it now suggests that any loss of fluid could be harmful to performance and to the athlete. Secondly, it makes a blanket recommendation of the rang of fluid volumes that would be required, without any acknowledgement of the fact that the exercise intensity AND the environment are critically influential to fluid losses (and thus requirements, according to the paradigm). This is very much the scientific equivalent of hedging one’s bets, and as we’ll see, the ACSM position stand later evolved into a more ‘scientific’ approach, when runners were told they should weigh themselves before and after a run to know how much weight they had lost. This of course, presents the runner with a significant dilemma – how do you know your sweat rate, or your body weight change DURING running? This is impossible, unless you run with a bathroom scale in your pocket! And making this measurement after training runs is not guaranteed to be accurate either, unless you can guarantee the same environmental conditions and running speed, which you can’t. So the position stand put athletes in a tricky position to begin with. The “compromise” at this stage (mid-1990′s) was even worse – it initially suggested to drink as much as possible. Blurring the lines – marketing or science? It was at this stage that the lines between “scientific advice” and promotional strategy had blurred. It is important to note that much of the research on the topic was funded by Gatorade, a company that produces sports drinks. The conflict of interests this created is staggering – an entire Institute, called the Gatorade Sports Science Institute, was created. A website, with a section dedicated to educating the public on fluid replacement needs, is sponsored by the company aiming to meet those needs. And perhaps not surprisingly, all the research of this time pointed in one direction – you need to drink, drink and drink. And when the marketing arm of the company used this information, they encouraged you to drink Gatorade! It is easy then, to make the assumption that the research and the marketing strategy were one and the same, because advertorials (think adverts, but with authority, because scientists endorse them) were being issued telling runners to drink as much as they could. DRINK BIG. Drink, drink and drink some more. Not just on race day but every day. Dehydration is one of the most common causes of premature fatigue during training and competition and it’s also one of the most common causes of sports injuries – pulled muscles cramps, dizziness, nausea and heat exhaustion. Like training for your big race, you need to train yourself to drink lots of fluids before, during and after the race. Remember, practice makes perfect! The likes of Jackie Meckler and Jim Peters would never have seen anything like this before. This approach soon produced results – an undesirable kind. For it is without doubt possible to drink too much (a fact even acknowledged by Gatorade in subsequent position stands). And that is exactly what happened. Spurred on by “scientific studies proving” that your body NEEDED 1200ml per hour (see picture to the right), runners of all shapes, sizes and speeds were set on drinking – the all followed the First Commandment – Drink, drink, and drink some more. The problem, as we shall see in post 3 of this series, is that the excessive intake of fluid can cause the plasma be diluted to such an extent that a condition known as hyponatremia develops. And people die as a result of hyponatremia. The condition was first called water intoxication, and the first reported case came in 1981, at the Comrades Marathon. A paper was written, and published, by Professor Tim Noakes, titled Water intoxication: a possible complication during endurance exercise. 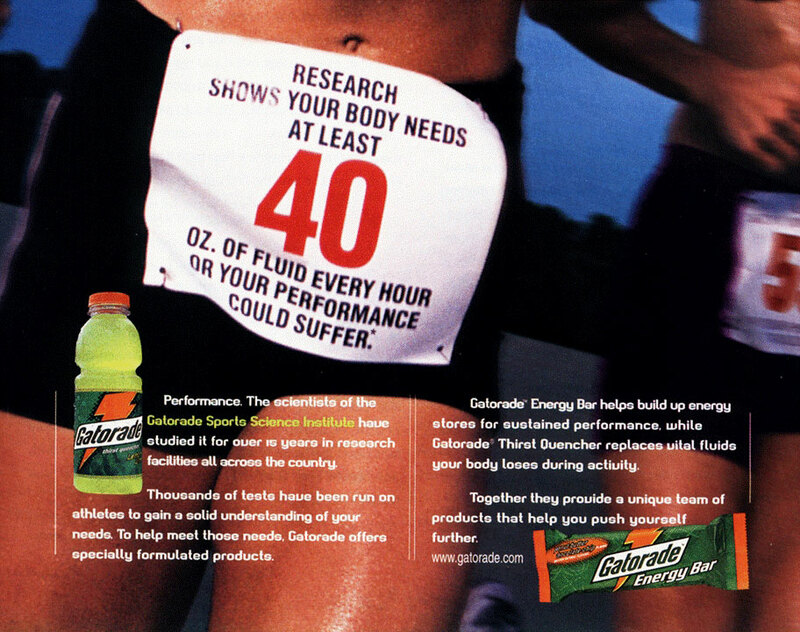 Remarkably, in the 20 years since that event, the scientific fluid-intake community, headed by the Gatorade Sports Science Institute, ignored this possibility and continued to advocate drinking to replace all sweat losses, encouraging runners to “drink everything in sight”. They even published papers suggesting that hyponatremia was caused by DEHYDRATION and not excessive fluid intake! The result of this “promotional” campaign, camouflaged as science, was that 247 cases of hyponatremia were reported between 1985 and 2002. Seven were fatal. A compromise of sorts was eventually reached, and the most recent (2007) ACSM position stand on fluid replacement reflects the growing awareness of the dangers of overdrinking. Gone was “the drink as much as tolerable” statement, replaced by the recommendation that one should drink during exercise “to prevent excessive (>2%) dehydration”. In other words, it’s now recognized that if you drink more than you sweat, you’re running into trouble. And 2% dehydration is now defined as an upper limit – 1 to 2% is thus acceptable, which is a significant departure from the previous concepts. The problem is still the dogmatic paradigm with which dehydration is approached – the entire basis is that dehydration is bad, despite a lack of evidence for this attitude. For example, it’s stated that dehydration is a major factor responsible for the development of heat stroke. Yet when the heat stroke cases are analysed, only 16% actually have “dehydration”, however that is measured (this is a problem, as we’ll see). So quite how a condition can be caused by something when only 1 in 6 cases have it is very odd, and one can only conclude that there is some other incentive to link dehydration to heat stroke. But the evidence is harldy overwhelming – 1 in 6 people. And that’s not to mention the thousands who are “dehydrated” and not overheated! As we’ll see, MOST people finish events having lost between 1 and 4% of their body weight. Yet fewer than 0.5% of people ever overheat. There’s something very wrong with that picture. And then finally, the biggest problem is that they are still prescribing the replacement of ALL sweat losses. The practical limit to this, in that the runner cannot possibly know their sweat rate, is the biggest barrier. And that leaves us in our current situation – runners believe that they HAVE to drink to replace sweat loss. They believe, having been told this for many years, that if they are even slightly dehydrated, that they’re in trouble. They also believe that thirst is not a good enough guide – if you’re thirsty, it’s too late. But is this true? We’re working towards an answer for that in future posts. But in this post, we’ve just highlighted the evolution of our fluid beliefs. We hope it strikes you as remarkable that things have changed so much since the 1960’s and before, and what an extra-ordinary conflict of interest exists around the issue. And we hope that it’s given food (or drink, as the case may be!) for thought, for in our next post, later this week, we’ll tackle the issue of dehydration and temperature. Those scientific arguments on this particular issue have long been debated. But what we would like to do is emphasize the “marketing” debate, because what we have here is a gross conflict of interests, which has been disguised as good and pure science that has resulted in the death of runners as a result of the excessive fluid they have ingested based on that science. The perception may thus be that Gatorade funds research. It does NOT – rather, it funds the endorsement, the “image rights” of scientists who proclaim the dangers of dehydration when the evidence accumulates all around them. In this way, science becomes marketing. In our next post, we’ll begin an evaluation of that evidence.